MEYERS (Mayers, Mires, Myres), JOHN WALDEN (Walten, Walter) (baptized Johannes Waltermyer; sometimes known as Hans Waltermeyer), army and militia officer, businessman, jp, and office holder; b. 22 Jan. 1745/46 (Old Style) in Albany County, N.Y.; m. there c. 1765 Polly Kruger (Cruger), and they had seven children; m. secondly c. 1817, probably in Belleville, Upper Canada, Sophia Davy; d. 22 Nov. 1821 in Belleville. John Walden Meyers was probably of German descent. At the outbreak of the American revolution, he was a farmer of modest means living with his family near Albany. His father decided to stand with the rebels, but in July 1777 Meyers himself set off to meet the army of Major-General John Burgoyne*, then advancing through upper New York. Tradition relates that on his trek Meyers was accompanied by his wife’s brother and by a faithful dog which became so fatigued that Meyers had to carry it. When his brother-in-law commented on this dedication to the pet, Meyers informed him, in the German accent he never lost, “We may have to eat him yet.” That is the earliest of the stories concerning Meyers, who became as much a legendary as an historical figure. Upon joining Burgoyne’s army, Meyers enrolled in the King’s Loyal Americans. Absent on a recruiting assignment, he missed the battles that led to Burgoyne’s surrender at Saratoga (Schuylerville, N.Y.) in October 1777. After this calamity for the British cause, Meyers made his way to New York City. 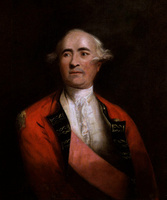 During the next few years he continued to act as a recruiting agent, first for Colonel Gabriel George Ludlow* and later for Lieutenant-Colonel Robert Rogers*. His principal contribution to the British war effort, however, lay in the gathering of intelligence and in the carrying of dispatches through hostile territory. On each hair-raising expedition Meyers managed to elude rebel troops while almost always returning to Fort St Johns (Saint-Jean-sur-Richelieu) with new recruits and prisoners. Some sources allege Meyers was so feared as an enemy agent that in New York state mothers warned their children that if they were not good Hans Waltermeyer would eat them. In August 1781 he was selected to conduct the principal attack on the house of prominent rebel Philip John Schuyler, the most memorable of his exploits, but Governor Frederick Haldimand*’s hope that the raiders would “procure Intelligence and . . . carry off some of the most inveterate and active Leaders in the Rebellion” was disappointed. Still, although the raid was unsuccessful, Meyers’s career in the army did not suffer. In June 1781 he had been authorized by Haldimand to raise an independent company. Unable to recruit sufficient men, he was given a commission as captain in Edward Jessup*’s Loyal Rangers on 13 May 1782. Meyers remained in this corps for the duration of the war. In 1782–83 he and his company did garrison duty in Quebec at Fort St Johns, Île aux Noix, and Rivière-aux-Chiens. He went on half pay when the rangers were disbanded in December 1783. With the end of the war in 1783 the Meyers family was forced to launch a new life. Initially, along with other loyalist officers and soldiers, Meyers settled at Missisquoi Bay, at the northern tip of Lake Champlain. His family soon joined him in Quebec and resided in Yamachiche while Meyers readied a more permanent home at the bay. As it turned out, however, Meyers’s plans conflicted with government policy. The authorities, fearing border incidents, did not want the loyalists to settle too close to the United States; Meyers and his comrades, for their part, were appalled at the prospect of relocating to the wilderness area west of the Ottawa River that had been set aside for the loyalist corps. The settlers insisted that only “Superior force” would drive them off their land, but the authorities prevailed in 1784. Having received permission to winter at Missisquoi Bay, Meyers moved in 1785 to the vicinity of Cataraqui (Kingston, Ont.). The following spring he resettled in what was to become Sidney Township and in 1790 he moved to nearby Thurlow Township, where he was to spend the rest of his life. In the late 1780s the government was encouraging the construction of mills, and in January 1788 Meyers petitioned for a mill-site in Sidney Township in the hope of adding a saw- and grist-mill to his already flourishing farm. Although he was turned down, he seems to have purchased another site in Thurlow Township. By 1790 he had built the district’s first dam and mill near the mouth of Meyers’ Creek (Moira River). This fledgling industry formed the nucleus of a community that bore Meyers’s name until it became known as Bellville (Belleville) in 1816. Soon Meyers began fur trading and, to the mill enterprises, added a distillery, an inn, and a number of vessels, including a small schooner that carried cargo to Montreal; among the people he did business with were Richard Cartwright* and David McGregor Rogers. Within ten years of their arrival in the Bay of Quinte region the Meyers family moved into one of the first brick houses in Upper Canada – the bricks were produced on one of Meyers’s farms. His achievements were the result of personal energy and the judicious use of capital provided by his half pay and by the money he received in compensation for war losses. When Meyers died he owned in excess of 3,000 acres of land and his estate was valued at more than £12,000. His claim to importance as an early Upper Canadian settler is enhanced by the fact that he served as a justice of the peace from 1788 until his death and as a captain of the Hastings County militia from 1798 to 1812. In 1800 he was appointed a commissioner for administering the oath of allegiance to new settlers in the Midland District, in 1802 he became first master of the local masonic lodge, and in 1820 he was made a vice-president of the Midland District Agricultural Society. Finally, he was one of the trustees responsible for the construction in 1820 of St Thomas Church, the first Anglican church in Belleville. During the American revolution Meyers had renounced personal gain in the loyalist cause: on one occasion he asked his superiors for money only “sufficient to support me whilst here and on my journey,” and on another he stated that “it is my Ambition to be serviceable.” Despite his dedication to British rule and law, he was never blindly loyal. Always ready to combat injustice, he fought hard for the good land that he felt was his due, and even as an older man he associated, if only briefly, with the reform movement of Robert Gourlay*. He was one of those who drew up the report on Thurlow Township in response to Gourlay’s questionnaire, and his son Jacob was the Sidney Township delegate to Gourlay’s convention at York in 1818. Meyers had the normal human foibles – he quarrelled continuously with his business competitor James McNabb* – but, on balance, his actions reveal him as a man of admirable character. He freed his few slaves long before he was legally required to do so, and he enjoyed the confidence of the Mississauga Ojibwas, with whom he traded. The hospitality of his hilltop brick house was famous. What confirms the personal stature of John Walden Meyers more than anything else is one simple fact: he was so talked of in his own lifetime that even before he passed to his final rest he passed into the folklore where he lives today. AO, Hist. plaque descriptions, “Capt. John Walden Meyers, 1745–1821, founder of Belleville,” 14 Aug. 1959; ms 768, G-5, William Canniff, notes on early settlement in Upper Canada; MU 1368. BL, Add. mss 21723: 91, 118, 151, 187, 251; 21793: 293; 21794: 84; 21795: 62, 228; 21820: 42; 21821: 21, 30, 218, 283, 316, 319–20, 323, 328, 348, 389, 424, 429, 442; 21822: 25, 148, 190, 208, 210, 212, 214, 249, 252, 272, 276; 21823: 7, 101, 111, 114, 152; 21836: 225; 21837: 38, 42, 52, 158, 318; 21875: 69. Ont., Ministry of Citizenship and Culture, Heritage Administration Branch (Toronto), Hist. sect. research files. PAC, RG 1, L1, 22: 293; 26: 141; 28: 390, 551; 29: 28; L3, 338: M11/276; 376: M misc., pt.i, 1789–1803:55; 377: M misc., pt.ii, 1788–99: 117, 200, 202; 556: leases and licences of occupation, 1798–1840/82; RG 5, A1: 2080–85, 8186–99, 12305–12. Douglas, Lord Selkirk’s diary (White), 178–80. Kingston before War of 1812 (Preston). Statistical account of U.C. (Gourlay; ed. Mealing; 1974). “United Empire Loyalists: enquiry into losses and services,” AO Report, 1904: 1050. “U.C. land book B,” AO Report, 1930: 50, 52. “U.C. land book C,” AO Report, 1931: 58, 71. Kingston Chronicle, 8 Jan. 1819; 5 May, 9 June 1820; 5 Oct., 30 Nov. 1821. Kingston Gazette, 13 Nov. 1810. Illustrated historical atlas of the counties of Hastings and Prince Edward, Ont. (Toronto, 1878; repr. Belleville, Ont., 1972). Pioneer life on the Bay of Quinte, including genealogies of old families and biographical sketches of representative citizens (Toronto, 1904; repr. Belleville, 1972). Mary Beacock Fryer, Loyalist spy: the experiences of Captain John Walden Meyers during the American revolution (Brockville, Ont., 1974). G. E. Boyce, Historic Hastings (Belleville, 1967). Canniff, Hist. of the settlement of U.C. H. C. Mathews, Frontier spies; the British secret service, northern department, during the Revolutionary War (Myers, Fla., 1971). Nick and Helma Mika, Mosaic of Belleville: an illustrated history of a city (Belleville, 1966). W. C. Mikel, City of Belleville history (Picton, Ont., 1943). E. A. Cruikshank, “Captain John Walden Meyers, loyalist pioneer,” OH, 31 (1936): 11–55. Mary Quayle Innis, “The industrial development of Ontario, 1783–1820,” OH, 32 (1937): 104–13. Robert J. M. Shipley, “MEYERS, JOHN WALDEN,” in Dictionary of Canadian Biography, vol. 6, University of Toronto/Université Laval, 2003–, accessed April 25, 2019, http://www.biographi.ca/en/bio/meyers_john_walden_6E.html.